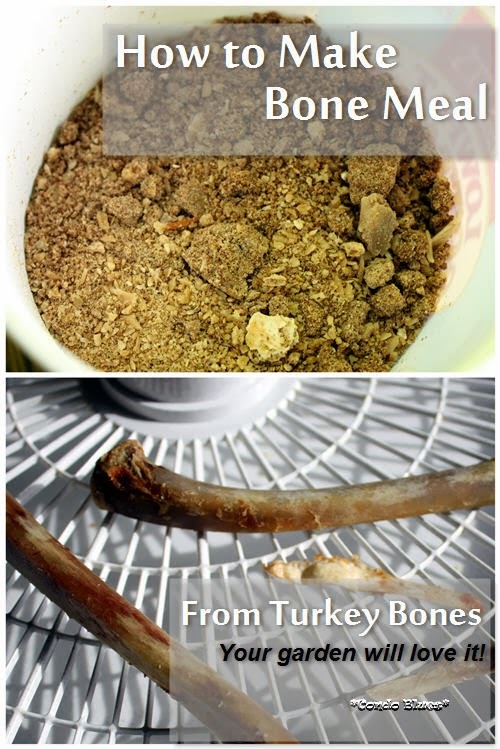 After some quality time with my friend Google, I got the kooky idea to try to make bone meal from leftover turkey bones for our garden. Leftover bones. I’m using turkey bones. Bones from other poultry and other cuts of meat will work although you could have a harder time grinding thick bones into bone meal. 1. Cook and clean all the meat off the bones. The easiest way to do that is to make crockpot stock because what ever bits of meat are left on the bones slides right off when the stock is ready. However, if you want to rinse and scrape meat bits off your bones, don’t let my stock making mania stop you from doing it that way. 2. Dry the bones. There are several methods you can use to dry the marrow in the bones. I put mine in my dehydrator to 160 degrees (F ) for 8 – 12 hours. Some folks dry the bones on an outdoor grill with the lid closed or pop them in the oven after they remove a roast and turn off the heat so the bones dry while the oven cools down. As long as the bones and marrow are complete dried, use whatever method works for you. 3. Break the bones down into smaller chunks by wrapping them in an old towel and hitting them with a hammer if needed. The longer leg bones wouldn’t fit in my blender until I broke them into smaller bits. During a later batch, I used a mason jar on my blender to grind a long leg bone and it shattered the mason jar! I recommend grinding smaller size bones in smaller batches in your blender or food processor to avoid this. 4. Grind the bones in the blender until they are meal. I use the ice crush setting on my blender or manually pulse it. The bone meal will not be the pretty bleached white of the bone meal you buy at that garden store but it will work just as well. I use a quart mason jar on my blender because I keep forgetting to order a replacement pitcher - three years running! 5. Add your homemade bone meal it to the soil and mix it up!